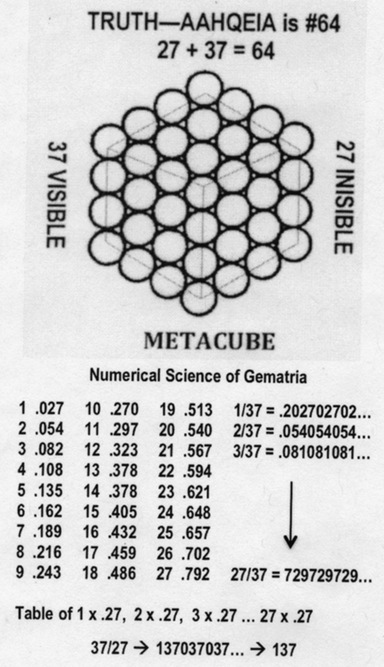 “The way in which this system of numeration was applied… consists of a symmetrical picture of a cube displayed on the flat in isometric projection as a hexagonal ‘stone’, and the parts of this image, visible and invisible, give all the mystic numbers of the series… Thus, TRUTH—AAHQEIA is #64, JESUS—IHSOTS is #888 and CHRIST—CRISTOS is #1480 … all that are visible of the 64 are Thirty-seven, leaving 27 hidden, nineteen on the posterior surface, and Eight at the heart of the greater cube.” T. Simcox Lea & F. Bligh Bond, The Apostolic Gnosis. In addition, numbers resulted from multiplied by 37 are visible, while those resulted from multiplied by 27 are invisible. Quantum Electrodynamics (QED) as the probability of interaction between Light and Matter. It has been the subject of intense study – many of the best physicists have felt that there must be some connection between alpha and the underlying structure of the Universe. 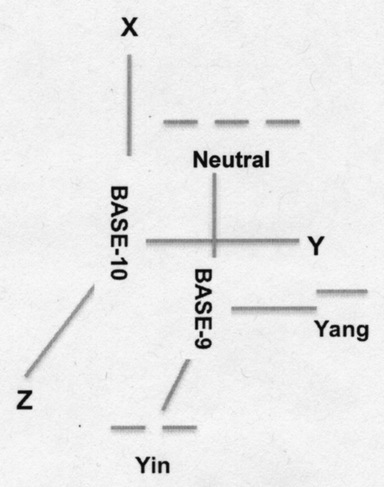 Adding or subtracting zero left or right to a number in Base-9 does not change the significance of that number. As stated in this Mind-Being Paradigm, the Universe started with God’s Input of Numbers in Base-9. This input corresponds to the Creation of the Logic Big Bang. thus, the meanings of numbers and its dimensions are of significant important. This is also the Greek’s, the Chinese, and the Biblical traditions. This was referred to as Pre-Quantum Logic, the missing part of Quantum Physics. In this Posting, an attempt is make to draw some correspondence mappings of the Ancient’s insight into God’s numbers and the modern quantum—gravity—String developments in E8 Group Topology. Some of the more important discussions on the integrations of Pre-Quantum and Quantum stated in previous Postings, such as Mappings of Strings & Line Dimensions, Branes—Cosmology—Multiverse, @ Through the Wormhole will be repeated here to emphasis their importance in the development of this FORMULA-27. 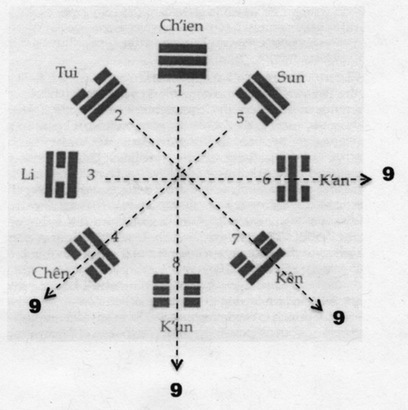 The logic of the 64 hexagrams formed by 8-trigrams is also a 248-dimensional structure. As shown, the 64-hexagrams is reducible to a set of 36 mirror hexagrams (27 reversible & 7 irreversible). 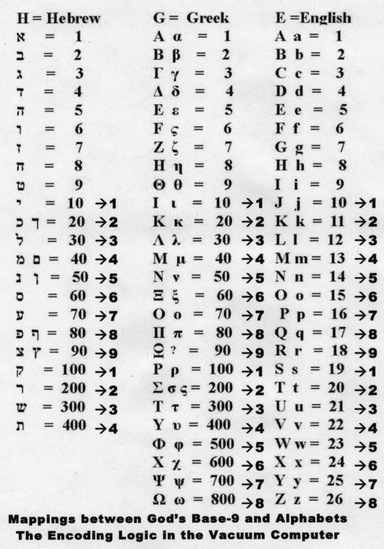 The 248-dimensions of these 36 hexagrams are: line-dimensions  6 x 36 = 216 free will dimension and 31 (in picking trigrams within the 27 reversible hexagrams plus hexagrams 27, 28, 61, and 62 = 27 + 4 —-> 31), and, 1 intention dimension. Therefore, the total line dimensions for intentional picking is 248. Thus, the initial-final conditions of the universe are apriori encoded in a set of computer programs describing the 64-hexagram and can also mapped onto the physicist’s set described by the matrix E8 x E8 symmetry. Yet, we now know there are over 500 elementary particles, so 36 generation is not too many. In fact, 36 divide the Universe in 3 equal levels: 0 – 36 Octaves —> forms the Information-Energy Universe in transition; 36 – 72 Octaves —-> forms the Energy-Mass of Universe of Classical Objects; 72 -108 Octaves —-> The Logic-Information Universe of the Vacuum Computer. When the Holon [Free-Will—-Intention—-Reference Frame] is added to each of the Octaves, we have 37 —-> Visible Truth. Remember Scientific Instruments can also to use in the state of observation (see definition for Truth below). Truth of Informed Knowledge: A perfect state of informed knowledge, relative to the maturity of the observer’s state of learned knowledge. The following steps are suggested for receiving and evaluating the truthfulness of informed knowledge. (1) Reception of knowledge must be unbiased; i.e., before receiving, the observer must empty his or her cup of learned knowledge. (2) The received knowledge and one’s learned knowledge must fit into a lock-key relationship. (3) The received knowledge, relative to the observer’s present stage of learned maturity, is true if step 2 is positive. Otherwise, put aside the informed knowledge for truthfulness evaluation at a later stage of the observer’s learned maturity. Notice, the status or the degree of truthfulness can change based on the observer’s state of learned maturity. We started this FORMULA-27 with the meanings of Numbers in Base-9; that is #64 à TRUTH, #27 à Unseen truth, #37 à Visible truth. Also Seen or Unseen would depend on the Holon [Intention—Free-Will—Reference Frame] between the Observer and the Observed. From these statements, there will be no Absolute Truth, only relative truth. How do these statements on TRUTH apply to the FORMULA-27 and its Dynamics? How can there be no Absolute TRUTH? The answer to this question is: These TRUTH is hidden in God’s Involution Logic, which encoded in God’s Computer. This set of Logic contains the Initial and Final conditions of the Universe. Thus, for any Observer to have a knowingness of the TRUTH, he, she, or it must have the knowing maturity of the three conditions stated above. These conditions can only be satisfied inside an Ascended State; namely the matured state inside Chakra-8. That is knowingness from both left and right brains’ the Holon of [Ancient—Modern—Post-Modern]. That is to say, to move toward the TRUTH, he—she—it needs to [Senses the Past—Knows the Present—Feels the Becoming]. Therefore, Absolute TRUTH can only be stated as a Becoming State. However, this TRUTH is bind with God’s Involution Logic. Therefor the closer an Observer matured toward the Ascended State, the closer he, she, or it would have the TRUTH knowingness. (3) Measurements of Truth: Invisible Truth Becomes Visible Truth as the State of Knowingness Matured. 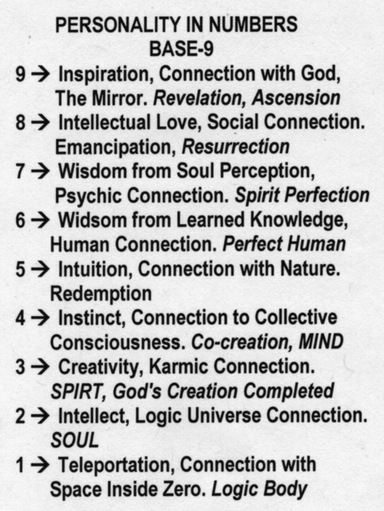 Mature in Observation via Spirit-Mind, Soul-Mind, and Instructional Science [i.e., meter reading in both scientific and radionic instruments]. What we have here is the Collapsing Base-9 into Base-10; for example 36 —> 9 into 37 —>10 or interchanging right-brain maturity with left-brain maturity and vice versa. 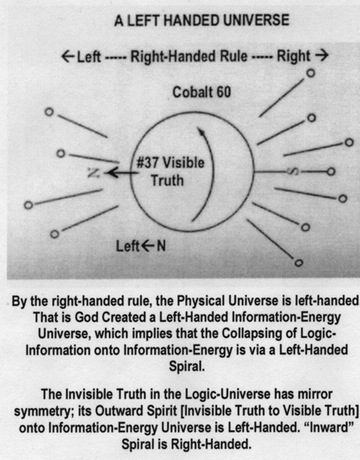 LEFT-HANDED INFORMATION-ENERGY UNIVERSE, LIKE THE LETTER BETH OPENS TO THE LEFT.